What’s the best microphone for gamers? That’s the question and to answer it we need to consider a few things first before we get to any recommendations. First off, you need to consider what your needs are – Will you be using the microphone for chatting to your friends over XBOX Live? If so, then the headset which ships with your console will be fine. However if you want to start streaming your game play online over Twitch, then you will require something a little better. If you wish to make high quality YouTube videos then you will need something approaching a studio-quality mic. Another thing to consider is where you will be doing your recording from, will you have a permanent space setup such as in your room or even a studio? Or will you need to trasnsport your mic about from place to place and use in different rooms. That’s something else that needs to be considered. Will you be streaming from a Console or PC? Will your chosen mic have the correct connections? Most microphones have USB cables but some more professional mics will use an audio interface to link their microphone to a computer. All things you need to bare in mind so let us do the heavy-lifting for you and breakdown what we think the best options are. We have spent many weeks pouring over specifications and carrying out internal testing to the point our studio is littered with microphones and cables! We have also talked directly to some of the manufacturers on this list to get a better idea of what goes into making a great microphone. Best Overall – Blue Yeti USB Microphone: Rated as one of the most popular microphones on the market today, the Yeti is commonly used as a recording microphone by upcoming stars. 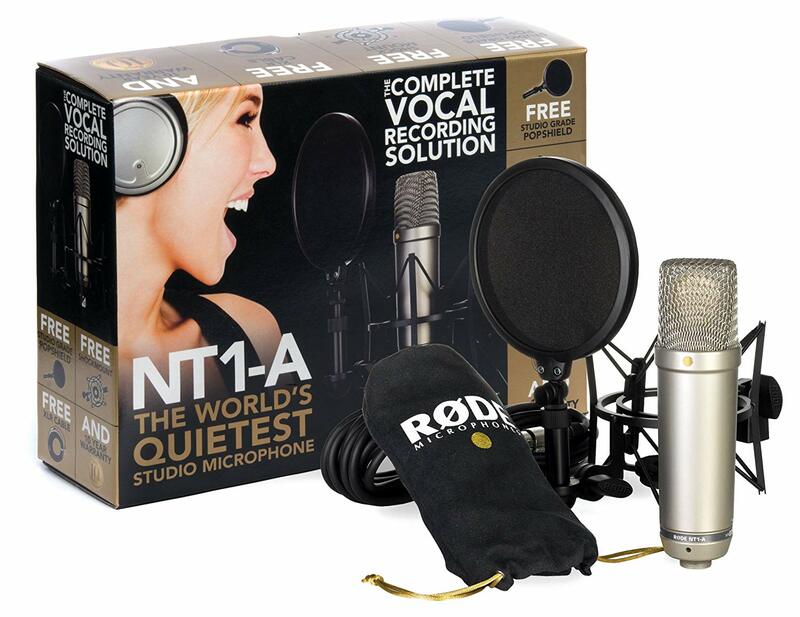 Best Package – Rode NT1-A Anniversary Vocal Cardioid Condenser Microphone: If you are looking for the full package with all the needed accessories, this will be the top option to choose. 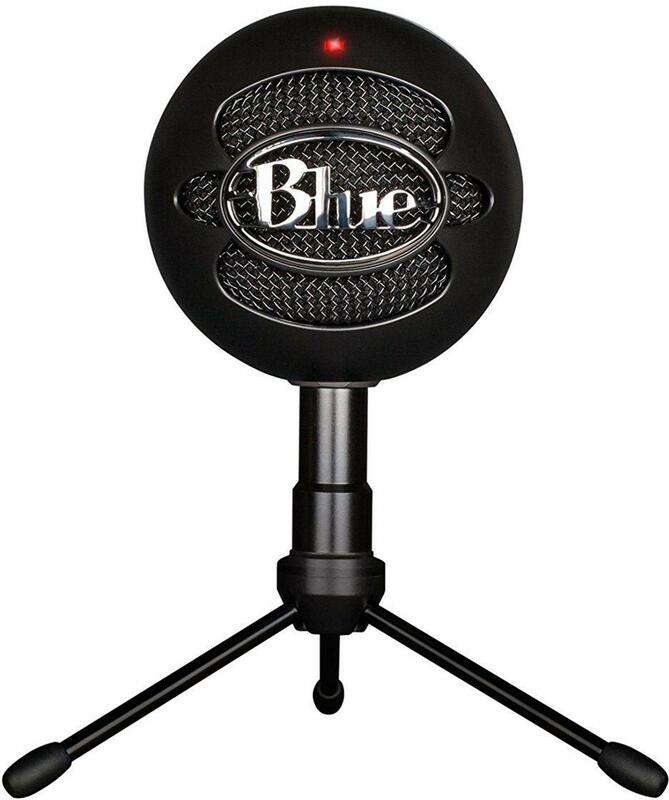 Cheaper Option – Blue Snowball iCE Condenser Microphone: Another Blue microphone that is designed with similar features to the Yeti, it is only a little cheaper. 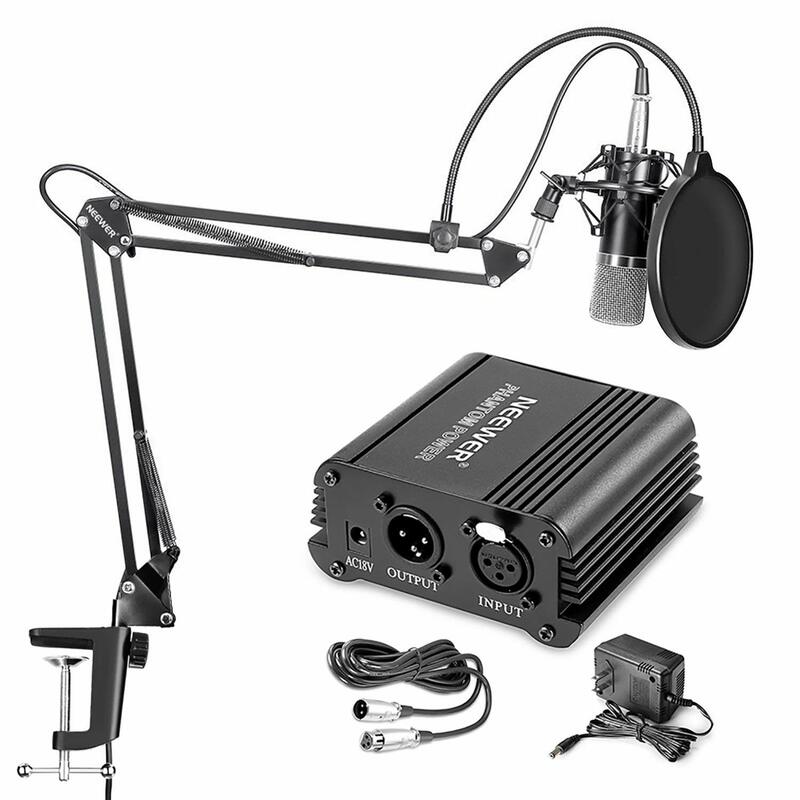 Portable Option – Samson G-Track Pro Studio USB Condenser Mic: Portability has always been important and this microphone emphasizes this feature. It is ideal for gamers constantly on the move. Read on as we start with our top picks, then we will give you a run down of our top ten and finally we finish with a Buyer’s Guide and a FAQ section to make sure you pick the right mic for your needs. Blue Yeti has always been regarded as one of the leading brands when it comes to microphones for commercial use. 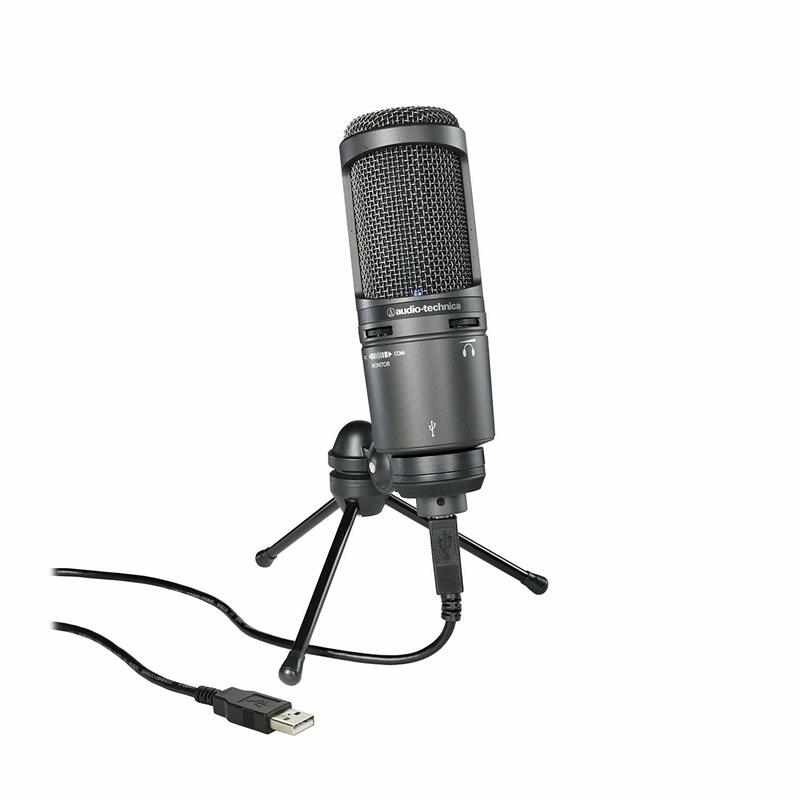 The Blue Yeti USB Microphone is an excellent quality microphone and it is also commonly used by podcasters and recording artists, but this mic will work wonders for gaming or streaming. 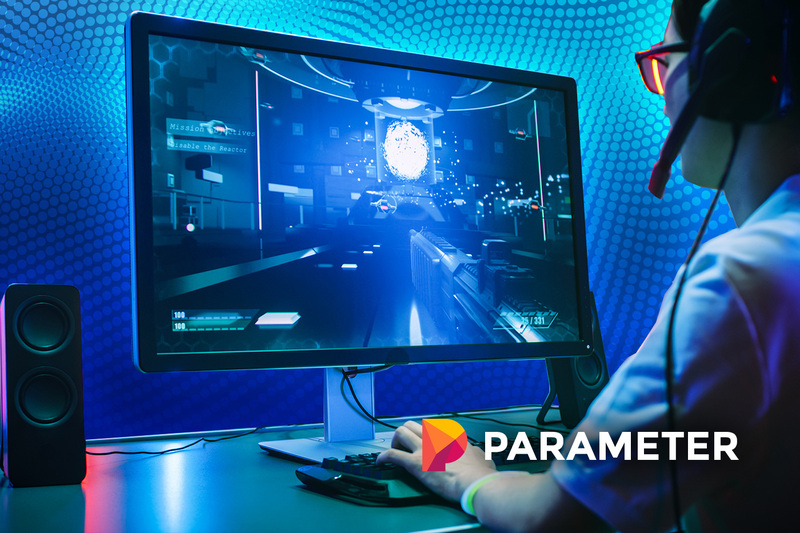 Since you can select your own polar pattern from bidirectional, omnidirectional, or even cardioids, you can actually interact with multiple groups of gamers or use it for streaming. The tri-capsule array with 3 condenser capsules means that you can actually use this microphone for studio recording as well. One of the best features is that the microphone is compatible with almost every operating system and platform. Since it works with a simple USB, it can be considered a plug & play microphone and you don’t need to have any real skills when it comes to the setup. With a zero-latency headphone output, you can also be sure that the headphone won’t give you any problems when communicating with your online friends in gaming situations. Since it is a tabletop microphone, it does have a couple of issues. The microphone is not portable and needs to be near a power source for it to actually work fully. It can also be a little bulky and heavy to move around, with no real option that will allow you to actually fold it or make things easier for those who are on the go. As for the price, it could be expensive for many beginners and it mostly considered an elite microphone that is used by recording artists. The microphone is designed to last and the overall durability is what definitely makes it a great buy. While the price is slightly high, you will have some peace of mind, as it is protected by a limited 2-year warranty. We consider this the best option currently available. While this might be considered a studio microphone, it definitely works well for gamers as well, especially since it is much more powerful than your standard USB microphone. With high SPL capabilities, the microphone is definitely in budget for those looking for a solid microphone and don’t mind spending a little money for a quality product. Since you don’t want to constantly hear yourself talk, the low self-noise level of only 5dBA, which definitely ensures that life is easier for those moments in the game when everyone is talking at the same time. A studio grade pop shield has also been introduced in this package, allowing your vocals to sound clear and concise, especially for streaming. Once you purchase this microphone package, you also receive a complimentary DVD and this will enable you to see all of the key features and how to effectively use them. Since this is a studio-grade microphone that has been designed for use by some of the most elite recording artists, the sound quality is definitely ideal for streaming and gaming. Additionally, a longer than average 20-foot cable has been introduced and this will make it possible to set up your device a fair distance away if you are using it for streaming or even live podcast. The gold-plated diaphragm also means that your sound quality will be amplified and your friends or enemies will definitely enjoy the quality in games. As for the price, this is one of the more elite microphones and it is used mostly for recording purposes. It can also be used for gaming, but you will be shelling out quite a few bucks to use it. Fortunately, the setup is rather easy, but you still need to invest in a microphone stand. This microphone comes with a 10-year limited warranty to give you peace of mind. 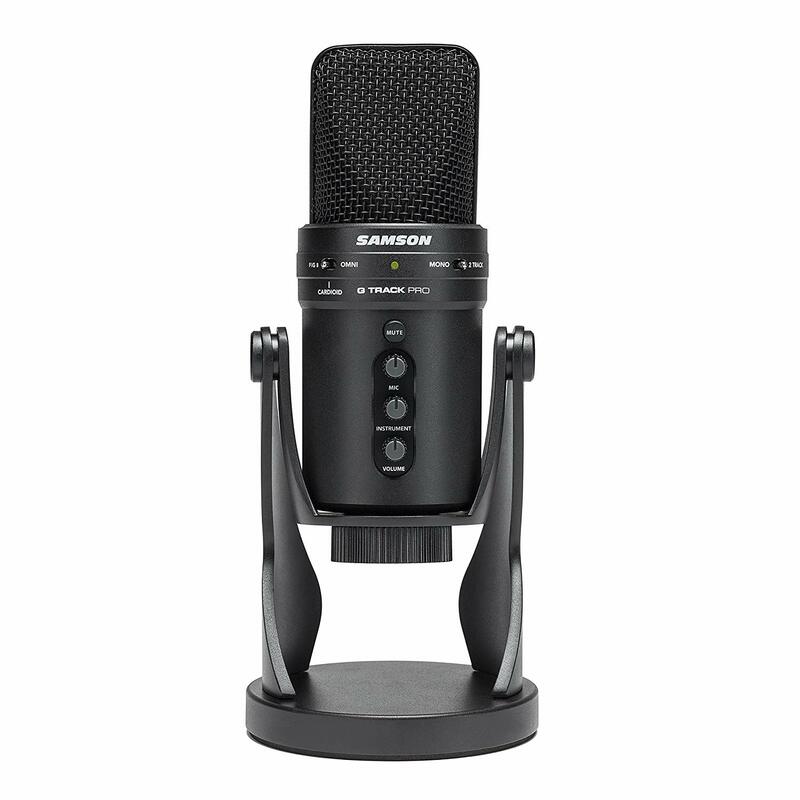 As a gamer, you might only have a set budget for your equipment and the Samson G-Track Pro Studio USB Condenser Mic is one that will definitely give you value for your money. Since it comes with a large 25mm diaphragm and a dual 1-inch capsule, the microphone is designed to enhance the quality of your vocals. The design has been specifically made to reject any noise coming from the back, but mostly focus on everything coming from the front. This means that you can set it up in front of your monitor and it will reject the sound of the game as much as possible. However, the polar pattern switch feature can also be used to make it bidirectional and also capture the sounds coming from behind. Compared to many other USB microphones, this one has one of the highest recording resolutions which makes it perfect for studio use. Since it makes use of a USB connection, the microphone can be used on various different platforms and this also includes your Mac or PC. The smaller size means it is much easier to carry around as well. Unfortunately, the mic does not really help to disregard vibrations and keyboard noise, if you have a lot of vibrations on your desk, the microphone does have a tendency to give you distorted sounds and this could be frustrating to many gamers. However, it does filter the noise coming from behind as we have mentioned for a clear sound. Since it is not considered an elite option for recording vocals, this microphone comes at a reasonable price. Yes, there are still a few that might be cheaper, but these quality features are definitely great for you. We would recommend this as one of the high-end USB microphones that will definitely ensure you have some clarity and excellent sound. The Blue Snowball iCE Condenser Microphone is one of the larger microphones we have on this list and it is also quite bulky. 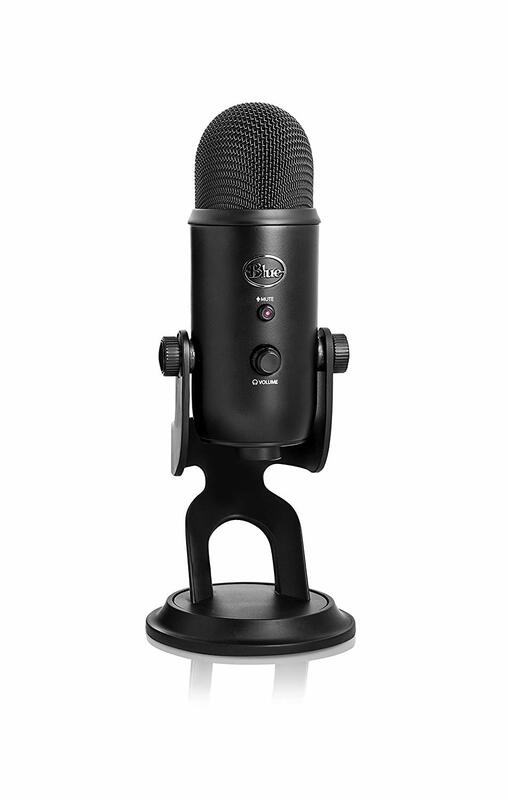 However, the microphone looks really stylish and should offer you a lot of functionality when it comes to setting up for your gaming endeavors, podcasts, and even those streaming endeavors. The custom condenser capsule has been specifically integrated to make life easier when you are using social media. Blue has specifically designed it to ensure excellent quality for sites like Skype and even Facebook. The microphone is available in 2 stunning colors that will also help to add to your equipment and make it look more professional. Since it works with a USB, there are no drivers that need to be installed and this makes it compatible with virtually every device that is made. It is USB 2.0, but can also be used with an additional USB 3.0 port and this is thanks to the reverse compatibility. It has been certified for use with your YouTube recordings to give you excellent sound. One of the downsides is definitely the size of the microphone and since gamers need something they can move around or even use in different areas when competitions are on, this microphone does make it a little harder. However, at 1.46-pounds, it is lightweight and can be carried. We just recommend taking care not to damage it when traveling. Blue is known for the Yeti and it is one of their most expensive microphones on the market today. The Snowball iCE Condenser Microphone is one of the most affordable and it works well for most people who might be strapped to a tight budget. The microphone also comes with a decent warranty from the Blue Company. It is hard to keep brands like Rode of this list, especially when you are looking for the top condenser microphones that can be used for gaming and streaming. The Rode NT-USB Microphone is another top quality studio microphone that has been designed to simplify your life when you are looking for crystal clear recordings. Once again, the ultra-low noise feature is included and this will ensure that you don’t need to worry about sounds and noise from the outside affecting your recordings. Since it comes with a USB connector, the microphone is completely compatible with all of your devices, with many people even using it with their tablets. One of the benefits is that this is not only a simple microphone and you have a top quality or studio grade pop shield included. It also spars you the added expense of buying a stand, with a top quality tripod stand included to ensure stability next to your PC as you are playing games. This can be folder to make it easier to transport. Since we have just discussed the mount, we should also mention that is not the most stable of mounts and it can occasionally let you down by accidentally tipping or moving. You might want to invest in a better mic stand to ensure that it does actually remain in position for the entire duration of your gaming or recording session. 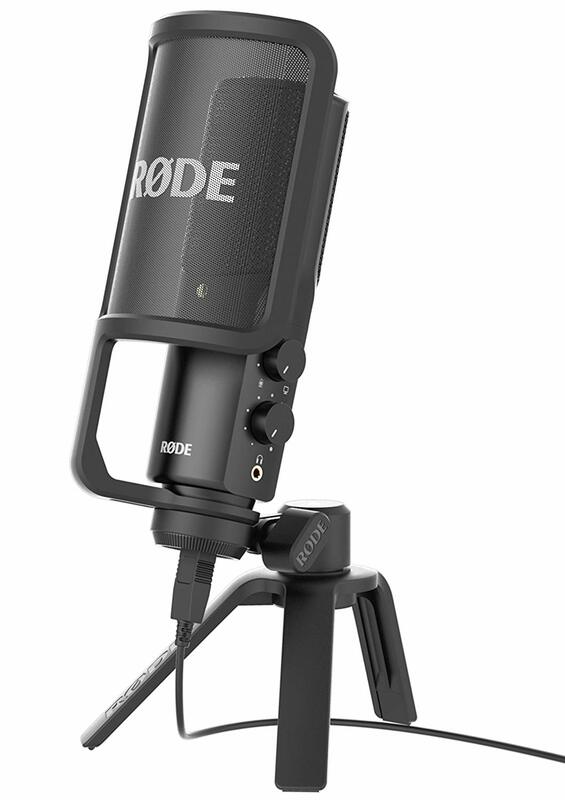 Rode is one of the high-end brands when it comes to commercial microphones and this might be one of the reasons for this one being a little expensive. However, we don’t think it is considered expensive and all of the features will cost you a lot more separately. It comes with a 2-year manufacturer warranty that will give you additional peace of mind. 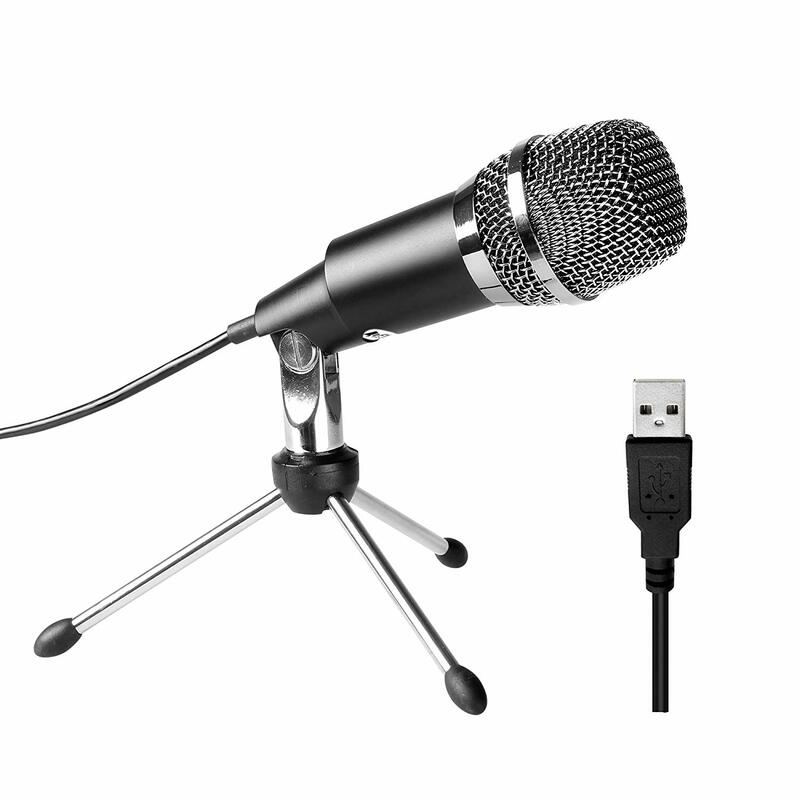 With USB microphones taking the lead role when it comes to gaming microphones, it is hard to leave out the Audio-Technica AT2020USB+ Cardioid Condenser USB Microphone. With a 16-bit A/D converter, this microphone is at the top of its class when you are looking at the overall price and some of the features included. We like this microphone for the basic simplicity of the design. Since it comes with a simple headphone jack, you can easily connect it to your quality headphones, while also controlling the volume when you are playing. The 44.1/48 kHz sampling rate is one of the reasons many recording studios like it and it gives an excellent sound output. Once again, the USB connection is what makes this microphone perfect for those looking to use it on different devices. It does not have any drivers that need to be installed and you can simply plug in the USB. It also includes internal headphone amplifiers that will certainly ensure you have excellent quality sound from your recordings. Since the microphone does not really come with a desktop stand, you will need to spend a couple of bucks to find the perfect option. It can be a little awkward and even uncomfortable to use on your desk and we do recommend finding a different stand. However, once it has been mounted, it will definitely be worth it for your streaming and gaming experience. When looking at the price, you will find that this microphone does have the same price as many of the top microphones on the market today. Choosing between them can be hard and you might want to settle for the cheapest option. The one major benefit is the additional 2-year warranty that should give you some peace of mind. Neewer might be one of those brands that you have not heard about much, but the Neewer NW-700 Professional Condenser Microphone is definitely something you need to consider. Once again, this is rated as a studio-grade condenser microphone and should definitely ensure that you have the best possible sound output. While it might not be USB powered, the device will definitely still work with most PC units and can actually offer you a lot of benefits for only a fraction of the price of larger brands. This package comes with the complete setup and you have a state of the art scissor arm and mount for your desk to keep it out of your face. The pop filter and shock mount have also been included to back up some of the essential features needed for recording. It can easily be moved around you have full height adjustability to play with as well. According to tests, we have found the sound to be just on the right level of all gamers to actually use it effectively. One of the downsides is that it does need a lot of setup and you won’t really be able to carry it around and use it for different traveling ventures. It does have an excellent design and should ensure you look professional, but don’t expect to have a professional grade microphone that is used for recording songs and albums. One of the reasons we have included it is the price. This is an affordable microphone that will definitely help you when you need one quickly. It is also worth noting that many of these features can be really expensive when you look at other brands. After using and testing it, it does seem to be one of the best options for beginners. As we move down this list, we thought it important to include a few more affordable options. 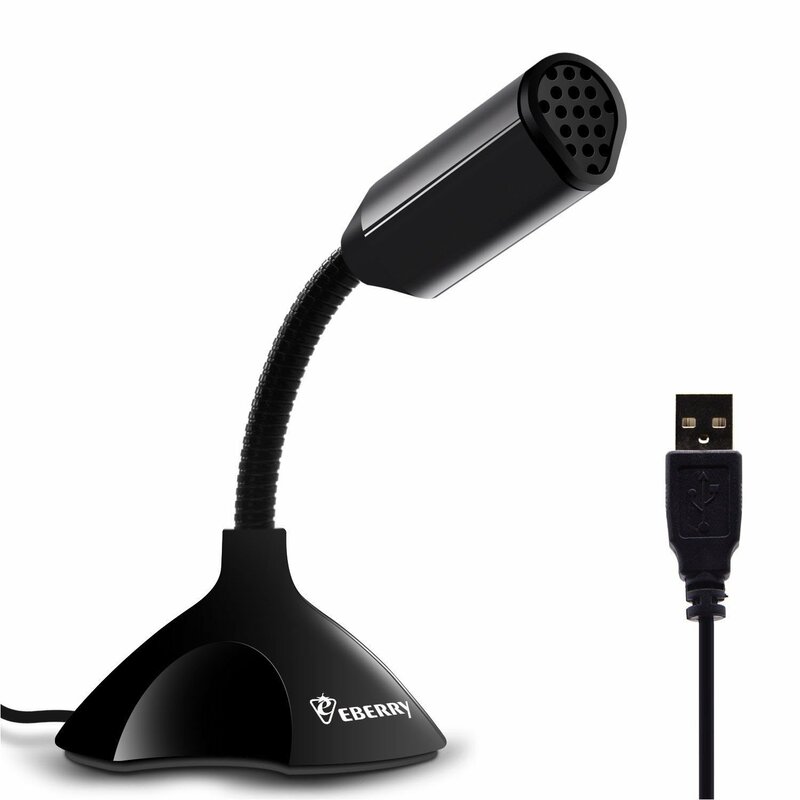 The eBerry USB Microphone is one of those affordable options with decent sound quality that will definitely enhance your gaming sound quality over your normal headphone microphone from the console or PC unit. It comes with a massive 3.5-foot cord length and this will certainly make it possible to0 record in various areas that might not be close to your PC. According to the manufacturer, it should filter out most of the background noise and provide you with a crisp sound, but we did notice a little background noise that still makes it onto your recordings. Once again, the microphone features a USB connectivity and this could potentially make it ideal for those with multiple PC units, as it can actually connect to virtually every one of them. It comes with a decent stand for stability, you can also change the neck to meet your needs when it comes to recording in the right direction. Unfortunately, it is not a professional microphone and won’t allow you to record some of your favorite songs. With no polar patterns, it is basic and the mount cannot be interchanged for something you feel more comfortable with. You also need to purchase all the accessories that might be required on your own, making it a little more expensive. The microphone itself is one of the cheapest options we have seen so far and this makes it an excellent budget buy. We could not find any real warranties that will keep you protected, but it should last for a year or so. This microphone is mostly recommended to those who are looking for a quick fix and a basic microphone for gaming. Continuing our microphones at the most affordable prices, the FIFINE USB Microphone is another one that you can consider. It looks incredible and while the materials can feel a little cheap, the design is made to elevate your equipment from the basic headphone. It also comes with a small mount that will work with any desk. You might have noticed a trend with us selecting the plug & play microphones and the reason for this is the versatility that they can offer. Much like the others, this microphone is compatible with both Mac and Windows devices. It also includes an extended frequency response to ensure the quality of recordings is good enough to playback. The microphone was specifically designed for most social media applications and with it being YouTube certified, it is an excellent option for your vlog. The frequency it works with is around 50Hz-16KHz, allowing the microphone to pick up on some of those faint sounds while eliminating most of the background noise you don’t want. While it does have some great features, the sensitivity does seem to be a little off. You might have your friends tell you that it sounds like you are far away from the PC. However, if you are only using it for gaming, it should work well and ensure that everyone can actually hear you much better than using your standard headphones. As for the price, it is affordable enough that you can buy it without worrying about wasting your money. It will be hard to find something that can actually match this microphone in the same price range. One of the downsides is that we could not really find a good warranty, making this a somewhat risky buy. It is definitely recommended for gaming. 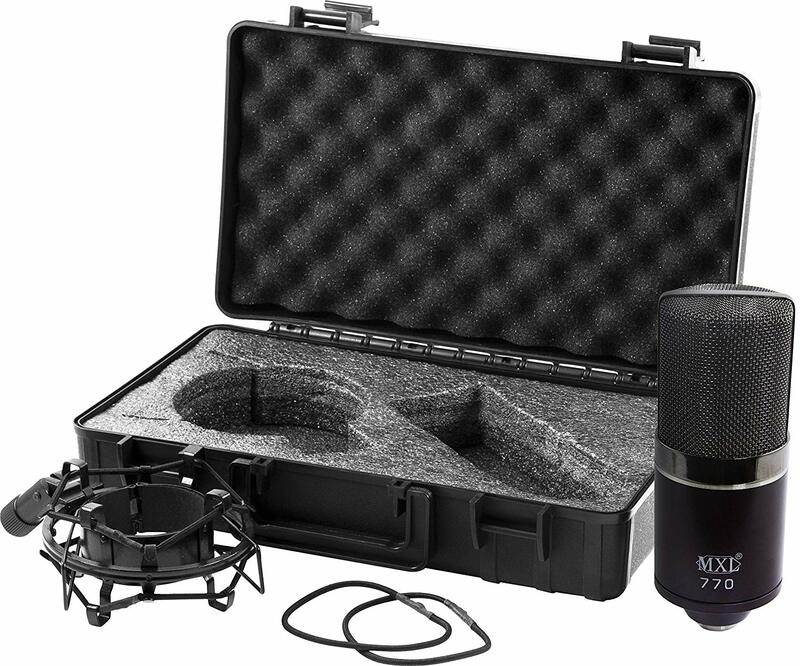 Last but certainly not least, we had to include the MXL Mics 770 Midnight Condenser Microphone. We have selected this microphone purely based on the already established reputation in the gaming communities around the world. However, it also features a good rugged design and seems to be rather durable compared to some of the others. With a -10dB attenuation switch included, the microphone is perfect for those gamers with a high-pitched voice. It helps to eliminate some of the sounds and you won’t sound like you are yelling to the other gamers. The bass frequency roll-off feature will help to ensure that your voice sounds clear and crisp to other gamers. While it is considered a studio quality microphone, it doesn’t come with a pop filter. You will need to buy this separately, but only if it is used for recording. The shock mount should be sufficient for gamers that need to deal with a lot of vibrations. The setup and mou8nting of this mic are rather easy and can be done by beginners. The main downside is the fact that it is not a plug & play option and this does reduce some of the portability. You need to buy phantom power on the side to keep it powered up and also an additional travel case to keep it protected. Aside from this, it does hold up well when taking a few bumps and shots on the road. If the price is what you are worried about, you should note that this microphone is a little more expensive than the cheapest models. However, it will all be worth it and the features are definitely state of the art and designed for professionals. We would highly recommend it as you next gaming or streaming microphone. You have now seen all the top microphones that we have chosen for gaming and streaming and they all have different features. However, there are a couple of common features that you can keep in mind when looking for a different model. We would highly recommend looking through this buyer’s guide to gain a better understanding of microphone features. USB Microphone: The USB microphone is probably the most common you will find you might have also picked up the frequency of us selecting it on the list. Since it features a plug & play setting, it is simple and easy to use, making it one of the easiest options for anyone with multiple PC’s. Condenser Microphone: If you are more focused on streaming, you might need to choose one of these microphones. Yes, we understand that the USB microphones are also condenser mics, but these are a little more traditional and they need to have an XLR connection for power. These are typically used for a podcast, but many gamers like the quality they offer. No matter which one of them you choose, you will be making the right decision. We like the USB options a little better for the plug & play feature they offer. However, it is still worth noting that they offer a lot of quality and value. The latter is considered more for the professional users and for studio use specifically. Gaming Settings: When you think of a gaming microphone, you automatically tie it back to your PC. However, you can also use some of these microphones for your consoles and even when hopping around with your mobile device. The only difference will be the size you choose and the type of microphone, especially with the accessories. PC gamers should love a stand or some sort of mount for their microphone, it makes it easier to place somewhere on the desk, but mobile gamers might need something a little more portable. You might need to consider the size and the portability of your microphone before simply choosing the one that looks the best. Bidirectional: This is the most common one you will find with most microphones and it simply implies that the microphone is capable of picking up sounds from two different directions. These microphones are ideal for two people sharing one. Unidirectional: These microphones are designed for studio purposes and they have a 180-degree angle at the front that is commonly used to pick up the sounds. However, it also picks up sound from the back, but faintly. Omnidirectional: As the name implies, these microphones can pick up the sounds of the entire room and they are commonly used for choirs and groups that are performing. It is also worth noting that they are a little expensive. While the bidirectional option might be the best for gamers and those streaming their live podcast, you might want to future-proof your microphone. The multi-pattern option means that your microphone will include all of these patterns and you can simply switch them on and off as they are needed. However, it could take a toll on your budget. Accessories: The microphone itself might be a great buy, but you still need to place it somewhere and having a good stand is also important. The stand of the mounting piece is probably the most important aspect of the microphone for gaming. It should be stable and keep it in place, allowing you to have the best possible comfort. If you have a high-pitched voice, you might need to look at the bass roll-off and things like a pop filter. This will help to keep your voice clear and your friends can actually hear the sound. The pop filter and shock mounts work together to help eliminate the effects that vibrations might have and provide you with the best possible sound quality. Warranty: Last but certainly not least, you should not forget to keep the warranty in mind. A good warranty will keep you protected from any manufacturer defects that could potentially leave you hanging without an expensive microphone. However, we could not really see the high-end microphones on this list have any real issues. The industry standard is around 2-years for a decent microphone and should give you some peace of mind. However, you are still responsible to look after it and keep it from being damaged when you are traveling. Will My Microphone Work With My Headset? This is actually another compatibility feature that you will need to keep in mind. Most microphones are fitted with the common headphone jack and this means that they will actually work with any headset you have. However, it will definitely be better to find a good headset for a good microphone to ensure you have decent quality. Will my microphone work on my console? The simple answer is yes, it should work on most consoles and PC units. However, the plug & play USB options are the best for those with consoles and it can easily slot into your USB port to ensure that you have a connection. It is best to do some additional research and find out if the USB connection is 2.0 or 3.0 to be compatible with your console. As we have also mentioned, you need to look for a good stand as well and this needs to be set up where you are playing. It can be a little harder for console gamers since the wireless remote control gives you some flexibility on where to play. Will I Need A Pop Filter For Podcasts And Streaming? The pop filter is one of the best accessories that you can ask for, especially if you have an audience that needs to be entertained. The pop filter will eliminate some of the background noise to ensure you are sounding clear and crisp to your audience. It can also have a positive effect on the sensitivity of the microphone. How long will my microphone last? Assuming you take good care of it and you have a decent carry case for traveling, it should last you a couple of years. The cheaper options might not have the durability, but we believe brands like Rode have developed timeless classics for the microphone industry. If you have made it this far, well done! Hopefully you have a better idea of which microphone to pick now. All the microphones on this list are a good choice and review well, you just need to pick the right mic for your needs. However, the Blue Yeti USB Microphone definitely stands out as one of the best of the bunch for all round features and sound quality. We chose this for the combination of studio quality features and the ease of use: simply plug it in and you’ll be streaming in no time. We definitely recommend it as the number one option for all gamers streaming stars of the future. Editor-in-Chief of Parameter and founder of Kooc Media, A UK-Based Online Media Company. Believer in Open-Source Software, Blockchain Technology & a Free and Fair Internet for all.